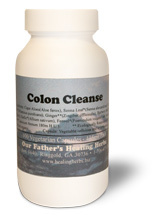 I don't know what I would do with out your Colon Cleanse capsules. I keep some in my kitchen cabinet, and also avoid all those uncomfortable times on my travels. They work just right for me and give me peace of mind. INGREDIENTS: Cape Aloes (Aloe ferox), Senna Leaf (Senna alexandrina), Cascara Sagrada (Rhamnus purshiana), Ginger (Zingiber officinalis), Barberry Bark (Berberis Vulgaris), Garlic (Allium sativum), Fennel (Foeniculum vulgare), and African Bird Pepper (Capsicum Annum 180m H.U.). Each vegetarian capsule contains 435 mg.